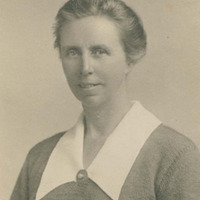 Unlike her predecessors, Constance M. K. Applebee had no medical degree and was a member of the first generation of professional female physical educators1. 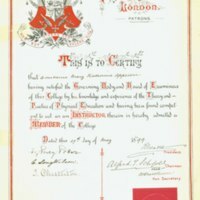 She was born in 1873 in Chigwell, Essex, England, and as previously mentioned she studied at the British College of Physical Education in London, where she received her license in 1899. In 1904, she was hired as Director of Out-of-Door Sports at Bryn Mawr College, and the next year she was named Director of Physical Education. In addition to her work at Bryn Mawr, she was a founding member of American Field Hockey Association in 1901, published the first magazine dedicated to women athletes, The Sportswoman, from 1924 to 1936, was instrumental in making the Philadelphia area the US capital of women's field hockey, and ran a field hockey camp in the Poconos in the summers. 1. Bloomfield, Anne. "Martina Bergman-Osterberg (1849–1915): Creating a Professional Role for Women in Physical Training." History of Education, vol. 34 no. 5, September 2005, pp. 517-534. Fletcher, Sheila. Women First: The Female Tradition in English Physical Education, 1880-1980. London: Athlone, 1984. McCrone, Kathleen E. Playing the Game: Sport and the Physical Emancipation of English Women, 1870-1914. Lexington, Ky.: University Press of Kentucky, 1988. Park, Roberta J. "Science, Service, and the Professionalization of Physical Education: 1885-1905." International Journal of the History of Sport, December 2007, vol. 24 no. 12, pp. 1674-1700.